Where to buy Morphe James Charles Palette February 2019? Lord & Taylor Valentine’s Day Gift Bag is available now plus new limited beauty boxes discount at Lookfantastic, Style Korean and Skinstore + many more gift with purchase updates! Selfridges has James Charles Palette in stock for 39 GBP and international shipping is 25 GBP or 15 GBP for EU. Morphe James Charles palette is Ulta exclusive (for USA). I got mine at Ulta. James Charles Palette link: ulta.com/james-charles-palette – currently OOS. Lord & Taylor (NEW) Receive your choice of Valentine’s Day pouch filled with beauty samples with your $100 beauty or fragrance purchase. (NEW) Choose your 4pc deluxe Clarins skincare set with any $75 Clarins Purchase. (5d) Receive a complimentary three piece clinique set with Any $40 Clinique Purchase. (3d) Use code LFLOVES to get 15% off – knock it down to $63.75. See all official Lookfantastic coupons and gift with purchase page here. Free shipping on all any $25 US orders. See all official coupon codes here. See all limited edition beaty boxes here. See all official gift with purchase here. See clearance and sale here. Style Korean (NEW) Through 2/10, grab 8 new Valentine’s Day Gift Boxes starts from $9.99. (HOT) K-Beauty Box #08 Starry Box $9.99 ($99 value). (NEW) Use code HONEYDOUBLE to get 20% off $100 purchase or HONEYSINGLE to get 10% off all orders. b-glowing b-glowing (NEW) Get 20% off Customer’s Picks orders $60 or more with code CUSTOMERPICKS! Valid 2/7 – 2/13. Biossance (NEW) Receive Free Shipping plus, a complimentary Rose Quartz Roller + travel-size Rose Oil with any purchase of $50 or more. Use code LOVE at checkout. Use code WELCOME to get $10 off $50 purchase or ALLURE to get 20% off. Don’t forget that you can try 1 of 3 sets here for free ($5 shipping). Free shipping all order. Birchbox (NEW) offers 15 Birchbox Man Limited Edition Boxes starting from $12 from hair styler box, shavecare box to essential kit. Bloomingdales (NEW) offers 5pc deluxe gift with $125 Estee Lauder purchase. (2d) Take $15 off Every $75 Purchase in Clinique. (3d) GIFT 1: Receive a 7-piece gift with any $29 Clinique purchase (a $100 value). Clarins Clarins (4d) GIFT 1: (6d) Free 6-Piece Valentine’s Day Gift with any $100+ order at Clarins! Use code LOVE19. Valid 1/29 – 2/9. Debenhams UK (NEW) 15% off our favourite beauty brands (6d) Free Clinique gift worth £64 with 2 Clinique purchases one to be skincare or foundation plus free step up gifts when you buy a third and fourth Clinique product. Dermstore (NEW) Receive a free 7pc gift. A $100 value, it’s your gift with any $35 Elizabeth Arden purchase. See gift with purchase and sample bag offers here. See See their sale section here. e.l.f. cosmetics (NEW) Shh! It’s a surprise. You’ll receive a FREE 4-piece mystery gift with your purchase of +$25 at e.l.f. Cosmets. Available while supplies last. Shop now! Valid 2/6-2/19 . FeelUnique US (NEW) Omorovicza 8pc Free Gift worth £85 when you spend £90 on Omorovicza. (6d) Treat Yourself Edit Powered by Feelunique £30 (worth £95). 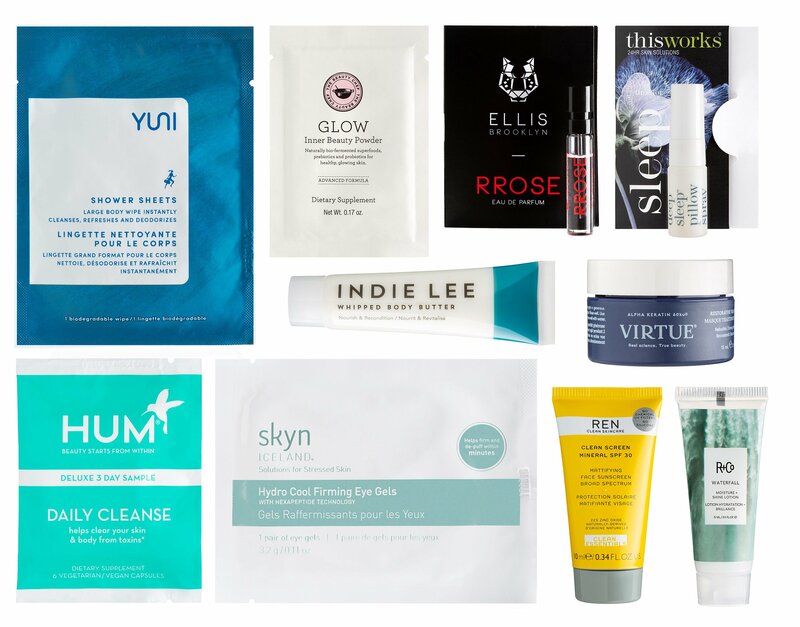 We’ve curated a collection of beauty treats for the ultimate self-care ritual; products that help to find your happy place and relax your mind and body. £3 from each box will be donated to Mind, who provide advice and support to empower anyone experiencing a mental health problem. Julep (NEW) New mystery kit – Glisten Up Mystery Box worth $125 for only $29.99. Kevyn Aucoin (NEW) Get a Complimentary 5-piece gift set with any purchase of $65 or more. Use Code VDAY . Valid Feb 6th – Feb 14th Plus Free Shipping on Any Order! Complimentary Sample! One sample at $50, Two samples at $75 or Three samples at $100. Lancome (NEW) Enjoy a 4 piece Sample + Free shipping with a $49 purchase! Plus, receive a Bonus Sample with a $75 purchase. Enter Code FEBRUARY. Valid 2/1-2/28. (2d) Enjoy 20% off at Lancome when you shop our Valentine’s Day looks! Use Code VALENTINE. Valid 2/1-2/14. Lancome Canada (NEW) Get an exclusive GWP ($138 value) with orders $88+ at Lancome Canada! Use the code RED at checkout. Valid 2/6- 2/28. Malin + Goetz (NEW) free stem edp. sample with all orders. Manuka Doctor USA (NEW) Our Manuka Honey Eye Cream. Best Seller Offer Price of $4.95 – Try Today. All orders over $50 qualify for free shipping. If your order contains Manuka Honey you will receive FREE US shipping. Marc Jacobs Beauty (NEW) Free Full-Size Le Marc Liquid Lip Cfreme in Your Favorite Shade, with Any Order of $50 or More, No Code Required! Spend $10,000+, earn $1,500 Gift Card. Use the code “BESTFEB” at checkout, ends 2/13. NORDSTROM (NEW) Up to 50% off Zella. (NEW) Shop the Omega+ Complex Moisturizer at PaulasChoice.com! Philosophy (NEW) Extended Flash Sale! 30% off sitewide at Philosophy with code: 30off. Valid 2/7 Only! (NEW) Use code STOCKUP to choose deluxe gift every $25 purchase. Free shipping on orders over $50. Pur Cosmetics (NEW) Use code FEBGIFT to get FREE Full-Size Big Look Mascara with purchase over $50 at PurCosmetics.com. Offer valid through 2/9/19. QVC (NEW) TATCHA Brighten & Hydrate 3-Piece Set for $125! If Sold Separately, $253! Safe & Chic (NEW) offers Ginger-Chi beauty box $50. Shop best sellers here. Free shipping on any $30 purchase use code FREE30. Saks Fifth Avenue (NEW) Get Up to $150 Off Your Women’s Denim Purchase. Use Code DENIM19. Valid 2/7 – 2/10. Sephora (NEW) Receive a Givenchy Rose Perfecto trial size with any $35 purchase. Use code PLUMP. (NEW) Pick up amazing, can’t-live-without-them deals while supplies last. Select products from Urban Decay, T3 Cura and more up to 50% off. Valid online and in-store from 2/7 – 2/13. UNIQLO (NEW) Don’t miss out our exclusive KAWS x Sesame Street plush toys for only $19.90. Hurry before they’re gone!